Here is a page out of the Superman: Secret Origin mini series I worked on. I love Christopher Reeve's likeness in Superman. This series brought back so many memories from the film, the tone of this comic was spot on! this image is so iconic! This looks great. I think Superman is a very excited multi-dimensional character. I think I meant exciting. 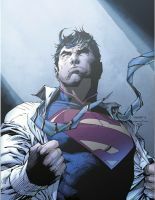 Gary Frank seems like DC's equivalent 2 Mike Deodato.It would b awesome if his art was like combined with Alex Ross's it could really modernize his charchters look's past that golden age/silver age style stuff he ussually does.I think it might b even better then Alex Ross and Jim Lee. I am absolutely NOT a fan of Superman (very boring one dimentional character), but I love this picture. The Iconic pose with the famous moment where the shirt is ripped (how much time does it cost him to sow all the buttons back on?) to reveal the "S". You absolutely did the character justice. What the?! Is this really Andy Park?! That guy disappeared. Someone must have hacked his dA account to post to be posting this. But just in case you are the real Andy Park, Happy New Year man. Hope you guys had a great Christmas. We need to hook up soon. I need some help with projects. You mustttt!! Whoa, YOU did work for a Superman series? Congrats! I would never have expected that, I had to clear my eyes and check again when I saw your name under the thumbnail. Well done on the inking! Thats awesome man, it's great to see artists with a wide range of talent such as you what with rendering, chopping and general art such as this. Keep it up, it's a pleasure to watch.